T̲H̲E̲S̲E̲ ̲B̲A̲R̲G̲A̲I̲N̲S̲ ̲T̲O̲ ̲T̲H̲E̲ ̲F̲I̲R̲S̲T̲ ̲B̲U̲Y̲E̲R̲!̲ Books: SUGAR IN THE AIR, by Large...$ .25 GOD'S SECRET, by Pier.........50 SHUDDERING CASTLE, Crawley... .25 TARRANO THE CONQUEROR, Cummings.95 GIRL IN THE GOLDEN ATOM, Cummings 2,00 MAN WHO MASTERED TIME, Cummings 2.00 THE WEREWOLF OF PARIS (Cloth) by Guy Endore ............... 1.00 Magazine Excepts Any of R.M. [?] Argosy stories .40 Any of Kline*s Argosy stories ,50 Any of Cunmings' Argosy stories .40 Or what DO you want? I may have it Sand cash OR money-order to: Fred W. Fischer, 2313 Laurel Ave., Knoxville, Tennessee - I want books by A. Merritt, Do you have BURN, WITCH, BURN? STICKERS! STATIONERY! COTT'S! Three words that go together. For quality printing send your order Cott's, "Printers for the fan.". Special introductory offer: 200 Full Size Letterheads! 200 Regular 6 3/4 EnvelopesJ 500 T̲w̲o̲ ̲C̲o̲l̲o̲r̲ Stickers I All for only $2.00 Postpaid. Fans like Bob Tucker, Harry Warner, Joseph Gilbert, Harry Jenkins Olon Wiggins, Lew Martin, The Plutonians; Organizations llke The Minneapolis Fantasy Society, The NFFF, The DFF, The CFS, The IFA, The "Dixie Press" Association, and Starlight Publications use Cott's supplies. Envelopes and letterheads any one color of ink, your choice of typeface, Order now! COTT'S PRESS ---- WAVERLY, KANSAS SAYS ICTLXZ, THE MARTIAN: SPLAFSK, XYZAGL KRPSON XZYTN !!! 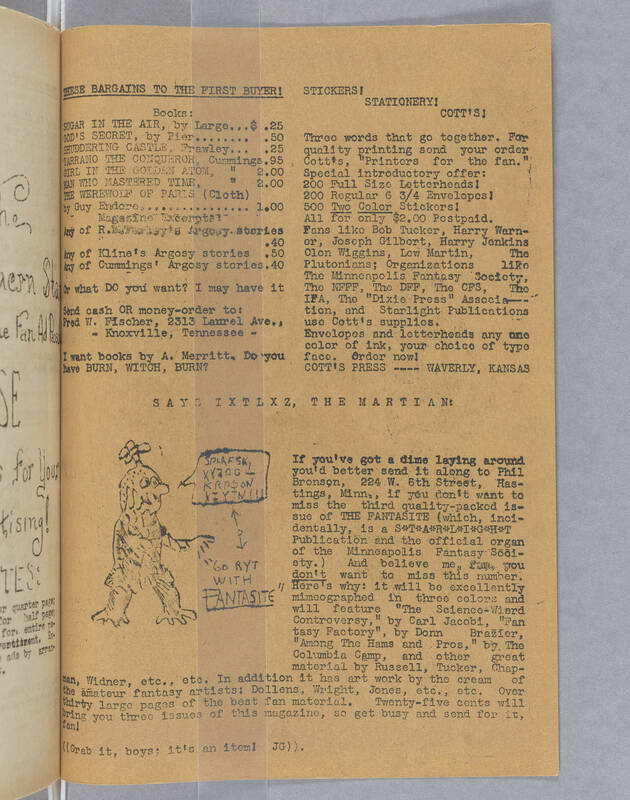 "Got RYT WITH FANTASITE" If you've got a dine laying around you'd better send It along to Phil Bronson, 224 W. 6th Street, Hastings, Minn., if you don't want to miss the third quality-packed issue of THE FANTASITE (which, inci- dentally, is a S*T*A*R*L*I*G*H*T Publication and the official organ of the Minneapolis Fantasy'Society.) And believe me, fan, you don't want to miss this number. Here's why: it will be excellently mimeographed in three colors and will feature "The Sclence-Wierd [sic] Controversy," by Carl Jacobi, "Fantasy Factory", by Donn Brazier, "Among The Hams and Pros," by The Columbia Camp, and other great material by Russell, Tucker, Chaman, Widner, etc., etc. In addition It has art work by" the cream of the amateur fantasy artists: Dollens, Wright, Jones, etc., etc. Over thirty large pages of the best fan material. Twenty-flve cents will bring you three issues of this magazine, so get busy and send for it, fan! ((Grab it. boys: It's an Item! JG)).